FlexoDome™ acts as a fence against the sensor contact and blower nozzle allowing the operator to invert the camera’s sensor downward without the fear of entering the chamber area damaging the sensor. This method facilitates the removal of heavier particles based on gravity action. FlexoDome™ eliminates the needs for shorter and narrower nozzles in bulb blowers allowing a directional blast for a more efficient dust removal. Directional blast maximizes the efficiency of traditional blower in removing dust particles without creating the adverse side effects. FlexoDome™ acts as a fence against the sensor contact and blower nozzle allowing the operator to invert the camera’s sensor downward without the fear of entering the chamber area damaging the sensor. This method facilitates the removal of heavier particles based on gravity action. However, this seems to be impossible task when camera’s sensor is faced upward acting against the gravity. By using FlexoDome™ one can remove all dust particles regardless of their size. Some bulb blowers use shorter or narrower opening in their nozzles to increase the blasting power of air and to avoid sensor contact. However, this results in higher friction between air molecules passing through a narrower opening, generating higher static charges, turning the sensor into a dust magnet. Another problem associated with the increase in blasting power of shorter and narrower nozzles are the projectiles generated by this method. These sharp microscopic particles hit the sensor with more force damaging the sensor coating creating images resembling the moon surface. FlexoDome™ eliminates the needs for shorter and narrower nozzles in bulb blowers allowing a directional blast for a more efficient dust removal. Directional blast maximizes the efficiency of traditional blower in removing dust particles without creating the adverse side effects. 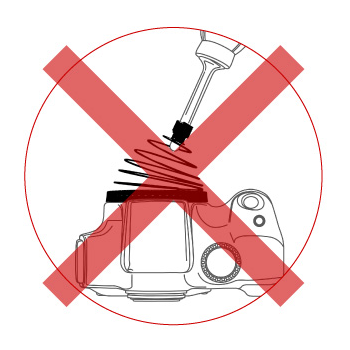 Make sure your camera’s battery is fully charged, or use your AC connector for the camera. 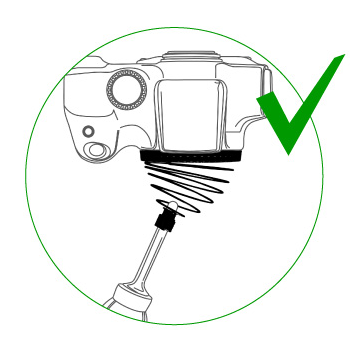 Mount your camera on a tripod or use FlexoDome™ to prevent accidental contact between sensor and bulb blower nozzle. Invert the camera’s sensor downward.